So often, inspiration comes from something subtle. A mistake. A tiny speck of color. A path that must be followed, a pot of gold that must be chased. 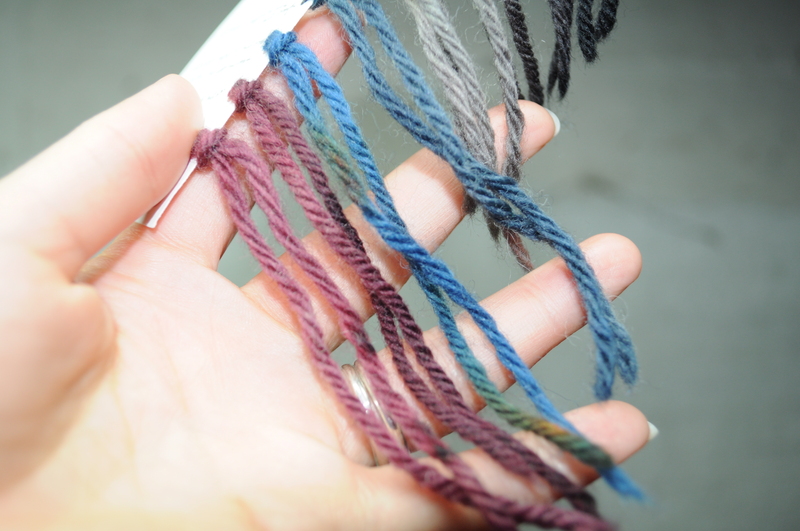 When I made the samples for my dye set, I placed a blue and an orange next to each other. When I wrapped them up, they touched, ever so slightly. The blue turned green, and brown. I loved the reds and black. 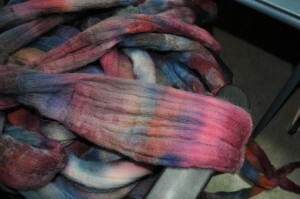 I was planning to dye the fiber in those colors. But this green caught my eye and held it. Blue and orange are two colors that I would never have thought to mix, but I was intrigued by the sample. Intrigued enough to take a risk. I took some reds and blues, and mixed in some orange here and there. Threw in a little black to tone things down a bit, and steamed it to set the dye. I washed the fiber out last night when I got home, and hung it up to dry. I could tell it wasn’t as saturated as I’d hoped. 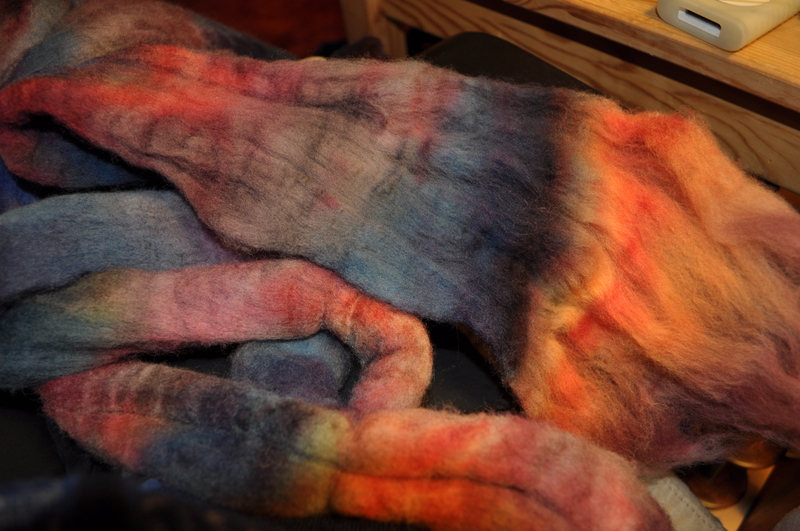 I think my fear of felting led me to leave too much of the soak water in the fiber, and that it diluted down my dyes. I liked the colors, but they were a pale version of what I’d had in mind. I was ok with them, but I wasn’t sure that I would love them. Honestly, I was a little disappointed. But then, a risk is a risk, and I was glad I’d taken it. When I got home, I decided to blog. I needed to pull the fiber out into the light. The only light that had a prayer of working was the grow light over the workbench in the basement. 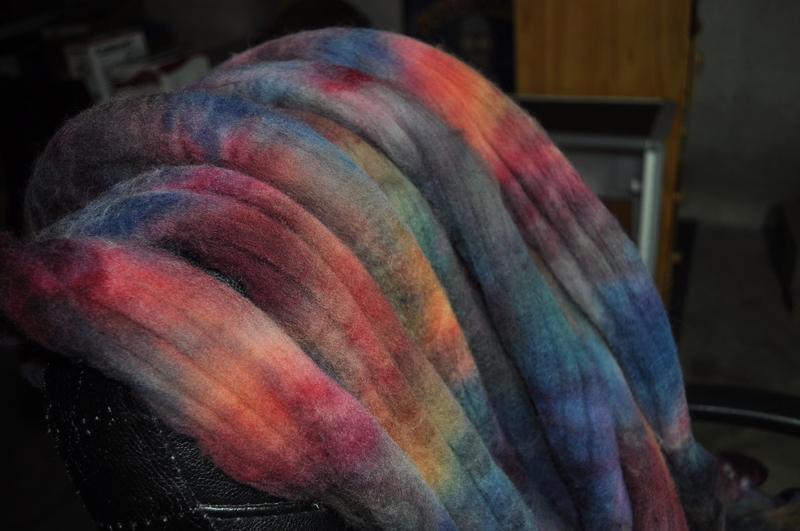 It wasn’t the prettiest environment for a new roving, and they aren’t the best photos, but taking them helped me to really see it. And the fiber isn’t quite the pale, dripping mess that I hung up last night. In fact, it has transformed into a rainbow. 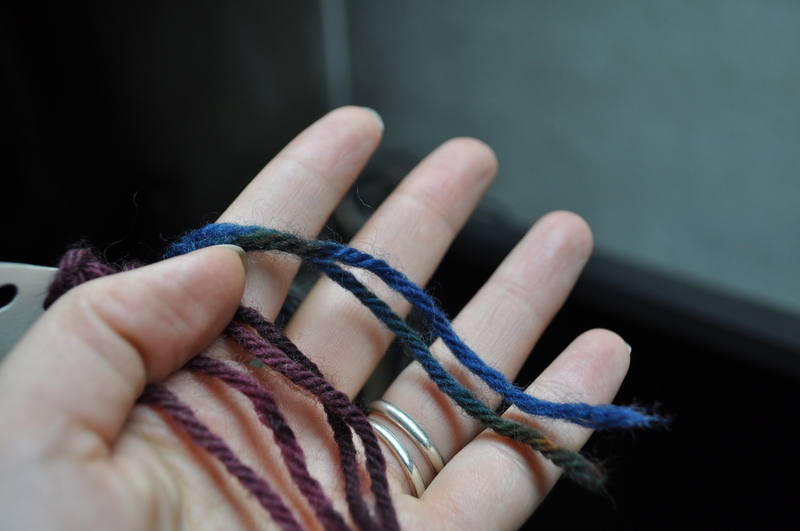 I finished taking photos, and sat down to try spinning it. As the fiber opens up, more and more colors keep coming, from bright oranges to soft shades of grey and mauve. I think I might be in love. It’s hard to hold a grudge against a rainbow, even if it’s not the one you thought you were chasing. It looks quite lovely! I can’t wait to see how it looks spun up! I agree, sometimes the unintentional can be just as, if not more gratifying. It looks like a beautiful sea creature! 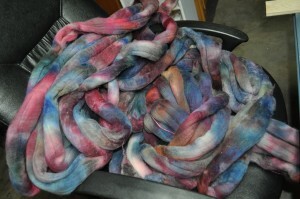 I can’t wait to see it spun. A rainbow indeed! It will be fun to see how it spins up. DesigKnit is powered by	WordPress 4.8.9 . Page generated in 0.349 seconds using 39 queries.